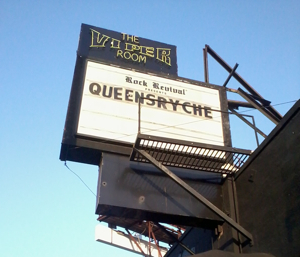 May 1st 2013, The Viper Room, Hollywood CA: Queenrÿche, the Todd La Torre-fronted version, signed a deal with Century Media Records and are all set to release a self-titled album on June 25th. Last night at the Viper Room, they gave us an early chance to listen to the whole album and followed it up with a special live performance at this intimate, invite-only event. I had heard a lot of good things about the rejuvenated Queensrÿche, and having missed out on their tour last year, last night was my first glimpse at how their new material sounds and how they handle playing the classic songs. The event started at around 7.30 when Scott Rockenfield and Todd La Torre appeared on stage to say a few words about the new album and thanked the crowd for their presence. Then we got to listen to the whole of the new album as it was played on the venue’s PA. Honestly, that’s not really the best setting to check out an album for the very first time, on speakers in a public place with lots of people talking to each other in the foreground. As hard as I tried, it wasn’t possible to hear the album properly. But from what I vaguely heard, the songs sounded fresh and modern with a touch of the classic Queensrÿche style. They’re definitely not trying to replicate the classic stuff and these tunes have their own identity, for sure. I look forward to hearing the album proper sometime soon. Straight after that, the band proceeded to take the stage. Seeing them on such a small stage was incredible in itself, as if they had turned back time to 30 years ago or something. You simply can’t get more intimate than the Viper Room. I had no idea what to expect from them, whether they would play a majority of the new album or a mix of old and new, but when they opened with the ever-amazing ‘Queen Of The Reich’, it dispelled all doubts and it was time to rock out to some good ol’ classic Queensrÿche. Despite seeing Queensrÿche twice in the recent past with the old lineup, strangely enough I had never witnessed this particular song live before. Thankfully, these guys changed that, for its Queensrÿche’s ‘Ace Of Spades’ and simply has to be played every time. They went on to play a great selection of tunes that represented the Queensrÿche catalog the right way, with no songs from any albums released after 1990’s ‘Empire’, except of course for the song ‘Redemption’ which will be on the upcoming album. Old-school Queensrÿche fans in the house seemed to be loving every moment of the band’s performance, and the small size of the venue allowed for a greater level of interaction between the crowd and the band, specially Todd La Torre as he did his utmost to get everyone involved in the chorus singing. As for ‘Redemption’, I actually hadn’t heard it before but what I said earlier about the new album applies to this song too. It’s a fresh-sounding version of the classic Queensrÿche. It’s not a copy of the old songs as many people would expect, so even though it takes a couple of listens to grow on you, it has its own identity and is a good live song. To sum up a tremendous performance, they ended the set with the title track from ‘Empire’, thanked the crowd and left the stage. I haven’t seen the new lineup put together by Geoff Tate’s version of Queensrÿche so I’m not going to be drawn into the competition right now, but comparing with the two times I did see this band with Geoff Tate on vocals in 2010 and 2011, for me the real difference last night was that each member of the band, not just the singer, was having a blast playing on stage. They weren’t doing it just for the sake of it, they were totally into it, and they were even happier to play the classic songs than we were to hear them. I had never seen Michael Wilton so expressive and delighted up on stage, but he sure did come across like that last night. Rockenfield was stellar on drums as expected, and Eddie Jackon on bass along with Parker Lundgren on the other guitar were efficient on their instruments and strong on the backing vocals. They did absolute and complete justice to the old material. My take on Todd La Torre’s performance is that he definitely infuses his own style and mannerisms into the band. He’s not a Tate clone by any means, and I can easily feel the difference in the two voices. He was hitting all the high notes but it wasn’t only about that, as with this selection of songs he was able to showcase his entire range. Even though this lineup has been going strong and playing shows for a good few months now, a lot of people are still looking at the singer and making comparisons. Last night’s set proved that it’s still important for the band to present their new frontman in the best way possible, and they’re certainly doing a splendid job at that, because I see no reason why anyone would not enjoy this guy’s voice and his on-stage energy.